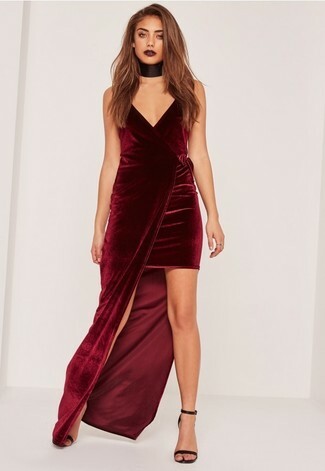 If you don't like trying-too-hard combos, reach for a burgundy velvet maxi dress. For footwear, go down the classic route with black leather heeled sandals. If you're scouting for a casual yet totaly stylish ensemble, opt for a white dress shirt and black and white print skinny jeans. These pieces are totally comfy and they also look amazing when paired together. When it comes to shoes, this look is round off wonderfully with black leather heeled sandals. 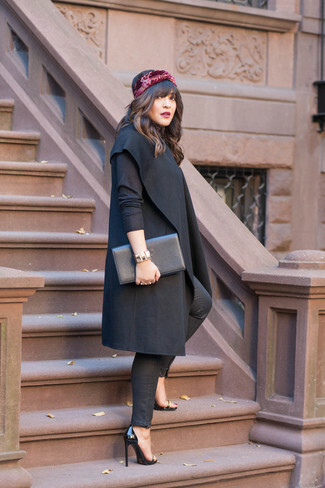 If you're in search of a casual yet seriously stylish outfit, pair a black coat with black leather skinny jeans. These pieces are very comfortable and look incredible when worn together. When it comes to shoes, this getup is round off really well with black leather heeled sandals. For an ensemble that's super simple but can be dressed up or down in a variety of different ways, go for a grey turtleneck and a grey wool midi skirt. When it comes to shoes, this ensemble is complemented really well with Givenchy Stiletto Heel Sandals from farfetch.com. Make a black tie-dye casual dress your outfit choice to be both casual and knockout. Bump up the cool of your ensemble by completing it with black leather heeled sandals. If you're after a casual yet incredibly stylish look, consider wearing a black turtleneck and a black leather mini skirt. As well as very comfortable, both of these pieces look great paired together. Rocking a pair of Givenchy Stiletto Heel Sandals from farfetch.com is an easy way to add some flair to your ensemble. Pair a dark purple leather biker jacket with black leggings for a casual-cool vibe. And if you want to instantly up the style ante of your look with one piece, enter Givenchy black leather heeled sandals into the equation. If you're looking for a casual yet incredibly stylish ensemble, pair a tan leather biker jacket with beige polka dot skinny jeans. As well as super comfy, these two garments look great together. Dress up this look with black leather heeled sandals. If you're all about comfort dressing when it comes to fashion, you'll love this chic pairing of a navy oversized sweater and a brown leather button skirt. Got bored with this look? Enter Givenchy black leather heeled sandals to shake things up.